You can save valuable preparation time by using a FedEx DG Ready solution with new shipping transaction options available in FedEx Web Services and FedEx Ship Manager© Server integrated solutions3. FedEx DG Ready shipping transaction options ensure FedEx shipping labels match the requirements of the specific dangerous goods and hazardous materials you transmit to FedEx using a FedEx DG Ready solution. Whether you ship hazardous materials once a day or once a month, you canâ€™t afford to waste precious time trying to figure out how to make your shipments comply with an ever-changing array of government regulations. Nor can you afford to be out of compliance, at risk for fines, injuries, or cargo claims. Haz-Shipper© increases productivity and reduces errors and potential fines by validating the shipment information with Government regulations and carrier standards. With the Haz-Shipper© (HAZMAT Compliance Software) you can create and save templates; check carrier limits; create your own technical name database; add LTD-QTY, RQ, etc. to the paperwork, share all databases (customer, template, etc.) for all modes of transportation. Haz-Shipper© is unique in the fact that it is a complete compliance checking software program. It has the logic of the 49-CFR, International Air, and IMO regulations as well as all FedEx and other standards. 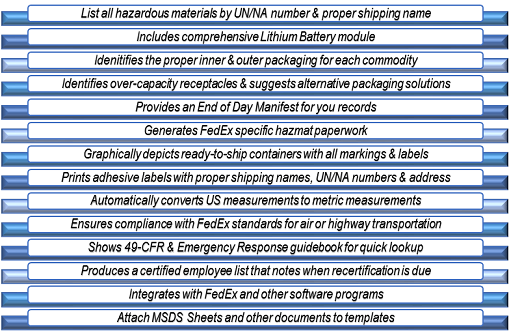 To Order Software, contact Dangerous Goods Council at 717-848-8840 or hazmat@hazshipper.com. Dangerous Goods Council provides complete hazardous material solutions for major companies all over the world. We provide complete training services for D.O.T. 49-CFR, International Air, and IMO related regulations. Our certified instructors have over 25 years in the hazardous materials industry. Ensures Compliance When Shipping Hazardous Materials. We will be conducting the certification courses for 49 CFR, International Air, IMDG & Security Awareness. We offer Seminars, Webinars and Custom In-House Training. FedEx service marks are owned by Federal Express Corporation and used by permission. 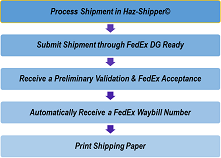 1The FedEx DG Ready Program is an electronic pre-inspection shipping aid that greatly reduces the chances that your FedEx Express dangerous goods or FedEx Ground hazardous materials shipment will be rejected due to an improperly prepared DG shipping declaration or hazardous materials shipping paper. It cannot guarantee the absence of all DG declaration or hazardous materials shipping paper errors or other errors that may ultimately cause a shipment to be rejected upon FedEx final physical inspection. Individuals tendering a shipment containing dangerous goods or hazardous materials are responsible for ensuring it is properly classified, packaged, marked, labeled and identified as dangerous goods or hazardous materials, and includes the correct dangerous goods or hazardous materials documentation. 2FedEx makes no warranty or claim as to the accuracy or completeness of any DG or hazmat shipping guidance or document provided by any 3rd party DG or hazmat software solution participating in the FedEx DG Ready program. Please carefully read all terms and conditions of any FedEx DG Ready software solution before use. 3FedEx DG Ready shipping transaction options are only available in 2016 or later releases of FedEx Web Services and FedEx Ship Manager Server. Not all FedEx™ Compatible 3rd party shipping solutions may offer access to FedEx DG Ready shipping options. FedEx DG Ready shipping transactions are currently available for most FedEx Express dangerous goods and FedEx Ground™ hazardous materials services. FedEx DG Ready shipping transaction options are not available for dangerous goods and hazardous materials services that can only be shipped using an airbill, manual shipping label, or bill of lading such as FedEx International Premium freight services, FedEx Ground Package Returns Program (pre-approved hazardous materials shippers only), and all FedEx Freight (LTL) hazardous materials shipments. Customers shipping dangerous goods or hazardous materials on a manual (non-automated) airbill or bill of lading can still use a FedEx DG Ready Solution as an electronic pre-inspection shipping aid, but must manually enter the tracking number from their shipping document into the FedEx DG Ready solution.